False advertising. Reverse swear box should be an ATM I curse at. Cursing passwords? Will not withdraw money if you are not genuinely emoting. Shows you a picture of some neighbor or celebrity you hate and g d m and f and then boom, 100 in cash flops out. Are you sure it is not just measuring your resistance? How about the music styling of ‘Richard Cheese’. Did anyone else thing “5 meg” as in “5 Megabytes” when they first saw it? No, you cup of putrid smeg. 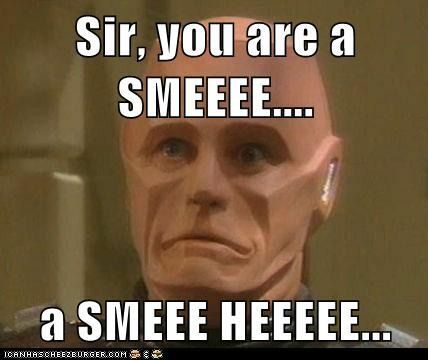 Smeg short for smegma i’ll let you look that one up. I’m not really impressed with this at all, but it might inspire some YouTube commentators to grab a soldering iron and learn a little bit of programming. Just thinking it would probably be more fun to have a big labelled “Swear Jar” that has a proximity switch and blasts out storms of invective any time anyone goes near it. Or coin slot with photointerrupter switch, so everytime you drop a coin in you get swear word. That would be true reverse swear jar. And good for getting your teenagers to donate to the household vacation fund. Until they figure out slugs, anyway. I like how he used the ‘BRAIN’ routing algorithm to get a single sided board with just a couple of straight links on the other side. The board looks really good for a DIY! I probably would have put a programming port on there to but I understand why he didn’t – they take up so much room for routing on a small single sided board. Surely, as this box has sworn at you, it should eject a coin ?